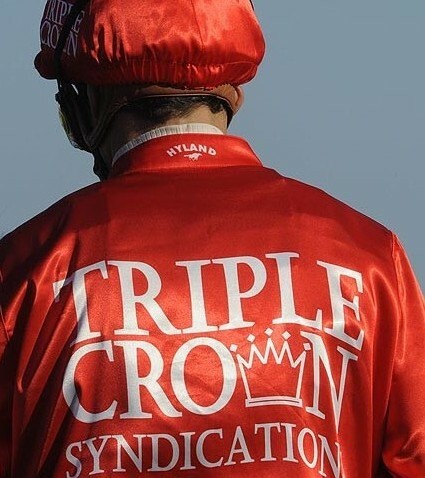 The Flemington carnival over Derby Day and Cup day has been very rewarding for the Triple Crown team of owners. On Derby Day, both Group 1 winner Hot Snitzel (Steven Arnold) and Group 3 winner Dothraki (Blake Shinn) represented the team in the same race which was the Group 2 Linlithgo Stakes over 1200m down the straight. Hot Snitzel jumped from the widest gate and Dothraki from the middle of the field, before they both pressed forward with Hot Snitzel crossing to travel behind the leader and Dothraki just a little further back again. It was a great sight seeing them both make their runs together and at the 200m mark you would have sworn they were destined to finish 1-2 however the leader Eclaire Choice proved a touch too strong to reign in with our boys finishing a very close up 2nd and 3rd to add further stakes success to their names. On Melbourne Cup day our attention at Flemington turned to Denpurr who was out chasing some very valuable stakes success of her own in the Listed Hybrid Plate over 1400m for 3yo fillies. After drawing a barrier out in the visitors carpark, we immediately knew her task was going to be tough. She jumped away ok from the gates with Kerrin McEvoy in the saddle before copping a little interference early on which saw her shuffled further back to travel at the tail of the field. As they entered the straight Denpurr was spotting the leaders a good 10 lengths before Kerrin angled her out for a clear run and pushed the button. She immediately showed her brilliant turn of foot and stormed home down the outside to claim 3rd position on the line and some very valuable black type for her pedigree. All three horses gave their owners a huge thrill and a fantastic experience on the big stage of Derby Day and Melbourne Cup day. Congratulations to our owners and thank you to Peter & Paul Snowden and their staff for preparing all of our horses to the highest standard.